Sigrid Undset’s trio of novels set in 14th-century Norway tells the story of a young woman named Kristin, daughter of the prosperous farmer, Lavrans (hence the name Lavaransdatter). 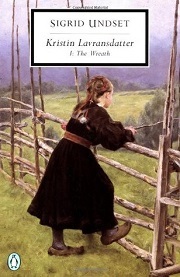 The first novel, The Wreath, translated by Tina Nunnally, was published in 1920, with new novels published in subsequent years. Undset received a Nobel prize, and the series is considered a classic in Norwegian literature. I saw a movie adaptation years ago and had always wanted to read the books, and I enjoyed the first book quite a bit. In The Wreath, Kristin’s family has been beset by tragedy in the death of multiple baby boys and the nearly fatal injury of Kristin’s little sister, Ulvhild. But the family maintains a strong Christian faith, albeit one that makes room for the ministrations of a local witch when it’s clear that her herbal remedies have the potential to save a life or ease pain. Kristin is eventually betrothed to a man named Simon, but a scandal that ensues after Kristin is nearly raped forces her into a convent in Oslo, where she meets Erlend Nikulaussøn, who comes from wealth but was excommunicated when he had an affair with a married woman and had two children with her. He claims the relationship is over, and Kristin, despite her devout faith, can’t keep herself from falling in love with him. And so it goes. I found those books at the library when I was young, and remember enjoying them, but reading what you say about them, I realize I don’t remember anything that happens. I’ve forgotten so many books that I liked. All I can remember is the good feeling I had reading them. My ma absolutely loved these when I was younger, and I’ve always wanted to get around to them. Plus, medieval Norway! It was great to read about a setting I haven’t read about before! I’ve read only the first one as well so far. It was darker than I expected but I don’t know where that expectation had come from! I have the next two but for some reason never felt strongly enough to get to them so maybe following your progress through the series will prompt me past that inertia. I’m hoping to get to the next two soonish, while I still have the momentum. I’ve read the trilogy and enjoyed it although the first book is the best. They’re not “happy” books – they make up the realistic portrayal of the whole life of a medieval woman in Norway. As I remember, Undset’s main concerns were getting the history right (she did) and Kristin’s character – what motivates her to make the poor choices she does make? Why does she feel bad later? What does she do (or not do) as a result of her missteps? What, realistically, are the choices for a rather high-spirited girl in Norway at this time? What was the hold of the church? Undset was divorced when that was a social stigma and then she became a devout Catholic – NOT appreciated in very Lutheran Norway. This was prior to writing Kristin Lavransdatter. I really appreciated how well-crafted Kristin’s character was. I could see that Undset was working through a lot of difficult ideas about personal choice and responsibility and morality. I can imagine it’ll only get more complicated. Many years ago, my book club read all three parts of this book. Finding a hard copy of it was nearly impossible, but I am so glad I did because it is an exquisite book. The other two parts are even darker and frankly depressing, but Undset writes so well that it was all part of the spell. I read this more than a decade ago, but I still remember various descriptions and scenes. It is one of the rare books I read and understood why it won the Nobel Prize for Literature. I just finished Part 2, and it is excellent–and darker, I agree, particularly toward the end.